When the time came for the Cleveland Cavaliers and the Golden State Warriors to meet in a rematch of last season’s NBA Finals, like most, we were stoked. These were arguably the two best teams in the National Basketball Association, and now that both were at full strength (for the most part), we were finally getting the matchup we’d craved since last year. Little did we know that after two games, the Cavs wouldn’t just face a 2-0 deficit, they’d be getting blown out of the building. So far, the 2016 NBA Finals has been a joke, and for most of it, the Cavaliers have been the punchline. The Dubs have controlled every facet of the game, and save for blowout wins in Game 3 and 6, LeBron James and company have looked like a shell of the team that breezed through the Eastern Conference. For the Cleveland faithful, the series has been far from what they were hoping for. While the Cavaliers and the Warriors have taken turns doing the the flexing in these Finals, it’s the good folks on Twitter who’ve been having themselves quite the time taking advantage of all the craziness. And in our opinion, these eight reactions perfectly sum up the first six games of the 2016 Finals. According to Kyrie Irving, the Cavs would’ve defeated the Dubs in last year’s NBA Finals had they been healthy. Now with a chance to put his money where is mouth is, Irving has been far from the superstar who Cleveland needs. Sure, Irving may have led the Cavs in scoring in Game 1 with 26 points, but when the Eastern Conference champs needed him in a bounce-back Game 2, he was nowhere to be found. Irving put up just 10 points, had one assist, and missed all three of his attempts from beyond the arc. The King needs Irving to step up against the Warriors, and all he’s done is let him down. Perhaps @netw3rk is onto something. Through the first two games, the Warriors have completely embarrassed the Cleveland Cavaliers. They’ve outscored them by an average of 24 points, have over 20 more assists, and have doubled them up from three-point range. This is the kind of beating that, if you’re the Dubs, makes you want to stand up and dance. And that’s exactly what’s going on here. 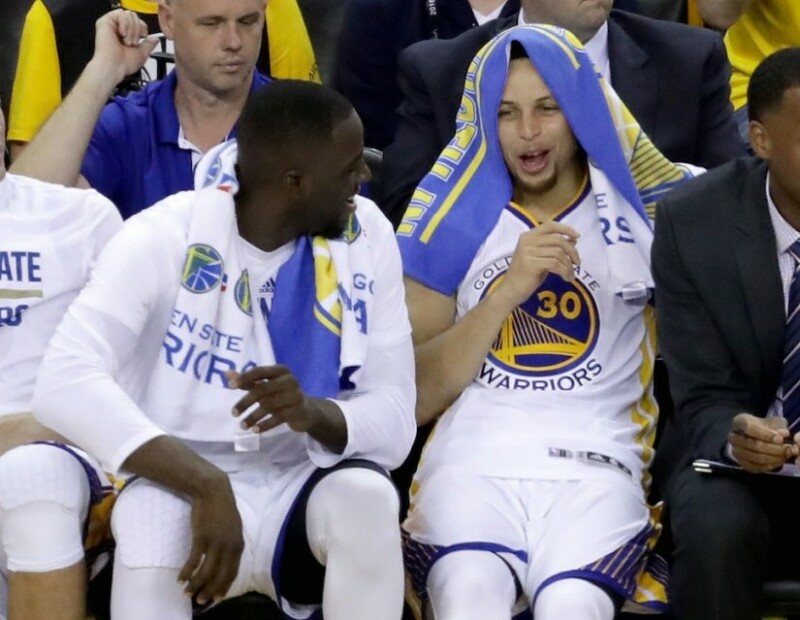 Normally we’d expect Stephen Curry to be in the middle of these three amigos, however, after watching Draymond Green decimate the Cavs in Game 2 to the tune of 28 points — on 11 of 20 shooting and five for eight from three-point range — seven rebounds, and five assists, we have no problem letting him have his moment in the sun. He earned it. If you want to portray Game 2 of these Finals in a single football play, you couldn’t do better than the above video. This is so on point, it’s scary. Irving looks to hit James with the championship trophy, Klay Thompson lays him out, forcing the ball to pop into the air, and Curry picks it off and runs it back for the touchdown while Kevin Love fails to do a damn thing about it. Sometimes, the truth hurts — this is one of those times. Still, it’s pretty hilarious. No matter how the rest of this series plays out, we still believe the Cavaliers were right to terminate David Blatt and make Tyronn Lue the head coach. That being said, his club is getting outclassed and thoroughly embarrassed. Lue has experienced these things in the Finals before. Only last time, he was a player, and it was Allen Iverson making him look like a fool. It’s only fitting that the day after Cleveland’s Game 2 beatdown marked the 15-year anniversary of A.I. infamously stepping over Lue during the 2001 NBA Finals. Given how easily Golden State is “stepping over” Cleveland in this matchup, it’s as if history is repeating itself. Unfortunately for Lue, this moment won’t be any easier to live down. The Cavaliers entered this Finals rematch with the intention of flipping the script. With a newfound identity, healthy roster, and another year of experience under its belt, this Cleveland squad was more confident and prepared than ever before. Unfortunately, so was the competition. Just when you think you have your opponent figured out, like in Home Alone 2, they drop bricks on your head — or in the Cavs’ case, buckets. This sequel is bound to have a happy ending, but that doesn’t mean it will be any different than the first film. The Cleveland Cavaliers are learning this the hard way. Since joining the Cavaliers, life — specifically adjusting to being the team’s third scoring option — has not exactly been easy for Kevin Love. Yet, even when he’s performing at a high level, the moment things start to go south, it’s only a matter of time before he’s attacked by critics. This can be overwhelming, and the 2016 Finals have been no different. After falling behind 3-1 in the series, with the only victory coming in Love’s absence on account of a concussion, the detractors have never been louder: perhaps Cleveland is better off without the former All-Star. Talk about harsh. No wonder getting a note with a “Crying Jordan” meme isn’t received well. Where’s the love for Love? The Cavs are in big, big trouble. Curry has spent most of the 2016 Finals looking like a shell of himself. Then Game 4 happened, and like Adam Sandler in Billy Madison, it was the MVP’s turn to unleash fury on the opposition. In his own way of chucking a dodge ball at kindergarteners, Curry hit 11 shots, knocked down seven triples, and finished the night with a game-high 38 points. If this is a sign of things to come, the Cavaliers better run for cover — trouble is coming, and it comes with a Baby Face. We’ve never actually considered Stephen Curry as Indiana Jones, but after watching this video, we’re having a hard time picturing anything else. With the Warriors on the cusp of winning their second straight title, the game’s ultimate prize is within the Chef’s reach. Yet, just when he thinks he has everything measured correctly, the trap springs into action and the boulder (with LeBron’s face on it) looks to run him down. In Raiders of the Lost Ark, Indy gets away. We’ll see soon enough if we can say the same thing about Curry.